Well, as I described in my last post, I have fallen in love with Starbucks’ Hazelnut Macchiato, a drink best described as a liquid hazelnut-flavored candy bar. Much as I enjoyed it and want more, but am not paying $3.50 for a 200-calorie sugary coffee drink. Not for a while yet. (No, I don’t want YOU to buy me one, either.) And besides, I’m still reading Wheat Belly, and want to avoid sugar as much as I can. . .sometimes I don’t. After seeing the term “non-alcoholic fatty liver disease,” or NAFLD, and its graphic description, I figure backing off sugar and being a bit paranoid about it (as well as wheat and soy) is probably a good course of action.This drink is made with a syrup as well as plenty of sugar, so, that’s for a special occasion, just like wedding cake is. So in my quest for replacing the sugar-laden coffee drink I crave with something less sugary, caloric and less expensive, I put my thinking cap on. Sometimes that cap is on too tight, but that’s another blog post. I’ve been using my 12-year-old cappuccino machine a little more lately, and while it doesn’t froth quite the way it used to, I think, it certainly works for my purposes. 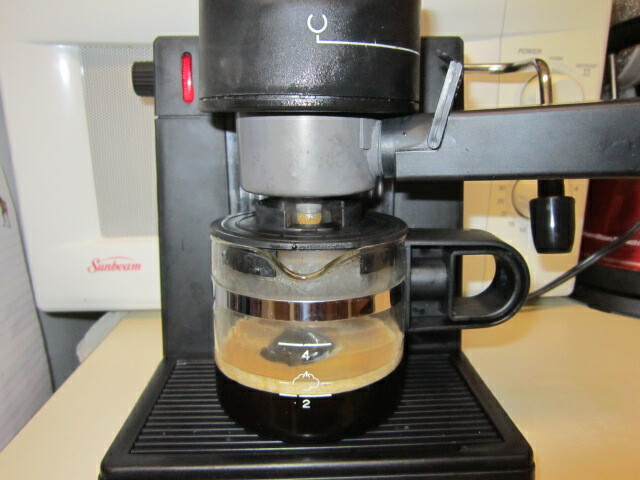 Besides, when I went looking at new, more modern cappuccino machines, I decided the one I have works just fine. Why do I have a 12-year-old cappuccino machine? When I was married to what’s-his-name (1996-2001), he got it in his furry little head that we “needed” one. (Where he got ideas like this is beyond me, but it wasn’t the first time, or the last.) I think I bought the first one, but it may have been one of our lovely wedding gifts. He knew how to use the metal kind you put on the stove, but not the electric kind. It fell to me to learn how to use it, and so, I did. 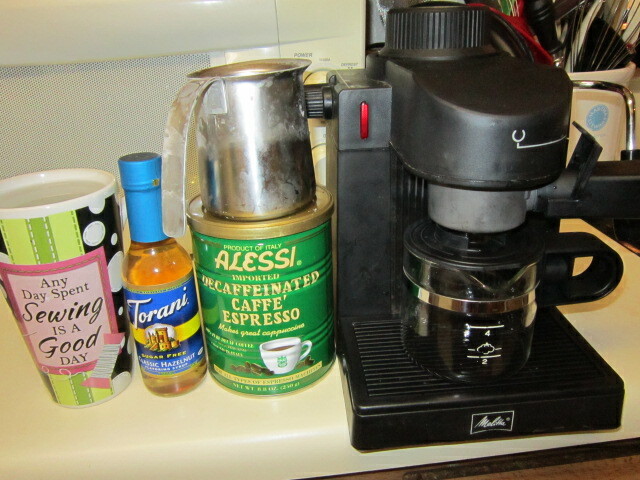 Then one early morning I made a cappuccino to hold me over until the regular coffeepot was finished. It was then that I knew I was truly addicted to caffeine. I’ve been on and off caffeine in the years since, but after my doctor told me to quit last year, I did, because one cup of regular tea in the morning was causing way too many problems. The original machine was white, and when it finally gave out, I got us another one. Right before we called it quits. So I’ve had it ever since. I use it occasionally, not every day, and only when I have fresh milk. Dunno if almond milk would work, but maybe I’ll try it. What I came up with was to get some sugar-free hazelnut flavored syrup and see how well it would work. I’ll tell you about that shortly. Really, macchiato means “marked” in Italian, and the drink is simply a shot of espresso with some frothy milk on it, and some syrup or something on top. I got the definition here--it was the first thing that came up when I did a search. So my version is really more of a cappuccino, not so much a macchiato. Alessi is the only decaf espresso I can find in Houston, and it seems like Central Market is the only place I can find it now. Darnit. The small Torani syrup cam from Cost Plus World Market, so that if didn’t like it, I won’t be stuck with a huge bottle of something I just wanna throw out. Please pardon my hard-workin’ dishpan hands. Like the very nice Ree Drummond, The Pioneer Woman, I am always in need of hand cream. Remember, idle hands are the Devil’s workshop. Mine froths milk pretty good, but it doesn’t seem to be as frothy as it used to. Of course, you could have other problems more important than this one. (Yes, I do.) Up until recently if you put your hand under there instead of milk, it would not only blow very hot air very hard, you would move your hand because it would get burned. Now, not so much. But it still froths milk pretty good. Yeah, I worry about this kind of thing from time to time. Keeps me from worrying about bigger, scarier stuff. So when the milk is frothed to perfection, I dump out the hot water (usually back in the kettle for tea later) and then pour the steamed milk into the cup, holding back the foamy part with a big soup spoon. Just like they do in Starbucks, except I’ve never worked there. Usually I do that and put in my accoutrements (3 packets of pink stuff and frequently a drop of vanilla extract) first, but if not, I add it at this stage. 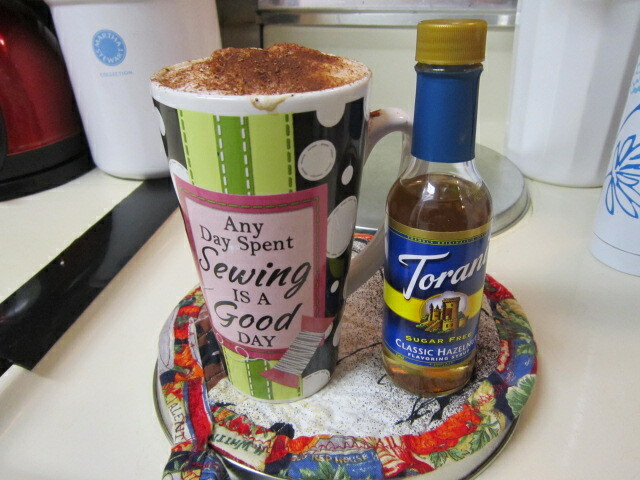 In this case, I added two tablespoons of the hazelnut syrup, but I think three would have been perfect. 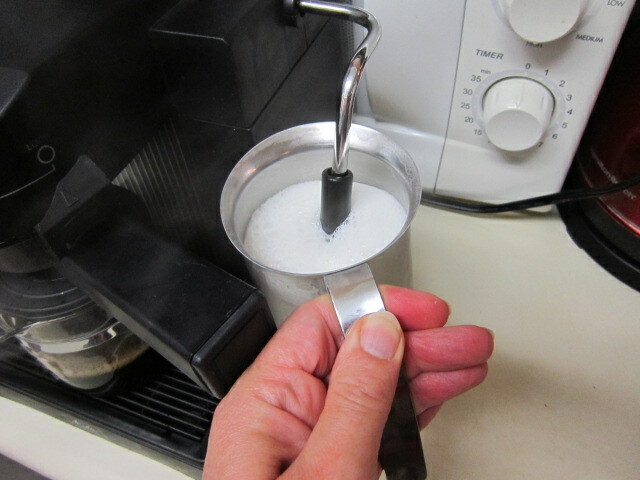 When the espresso is finished brewing, I dump that in, then put the frothy milk on top, using a rubber spatula to get all of it out of the pitcher. Have you ever tasted frothed milk? Then you’ll know why. Now, most cappuccino aficionados sprinkle ground cinnamon or ground nutmeg on top of the frothy milk. Not me. Used to do that and one day decided to go all Giada and sprinkle cocoa powder on top. So Drs. Frasier and Niles Crane can fuss all they like at the Cafe Nervosa. . .me and Giada will be chillin’ with chocolate. Yes, that cup describes one of my philosophies. It also makes me a hypocrite because I have an unfinished fall/winter suit hanging up, and another one to make. I should have finished those by now and working on the “some other time” small projects. It’s March, I should be making spring stuff. Stitch ’em up, move ’em out, you know? I have a Donna Karan suit that’s been waiting to be made for three years now. But at least the cup reminds me I can go back to it any time I want. How does it taste? Well, not EXACTLY like the one from Starbucks, but it’s a pretty good substitute that I can be happy with. The Torani syrup contains Splenda, which is something I normally avoid because of its chemical composition, and I’ll try another hazelnut flavoring without sugar, sucralose or aspartame in it. So if you’re considering having something a little different, you are welcome to use my example and follow my blazed trail. Cappuccino really is good, and so I’m glad I have a machine to make it with, and I’ll consider adding different flavorings if I can find them easily. Meantime, I’ve got to go wash up my cappuccino machine. Happy Easter, Passover, Bunny Day, and Sunday!